With the sunny summer months gone, and September rolling in, several flowers in your garden will stop blooming and leave your garden looking dreary. Wouldn’t it be great if you could find beautiful plants that will bloom beautifully in the September weather of the Pacific Northwest? Well, we’ve put together a list of flowers and shrubs you can grow this September to keep your garden looking bright and colorful throughout the fall season. Salvia Patens – If you’re looking for a way to turn your garden into a scenic blue space this fall, then this plant is the solution. Also known as Gentian Sage, this elegant plant flaunts the deepest blue colored flowers with erect tubes that keeps shining throughout the fall season. Monarda – Also known as Bee Balm, this brightly-colored flower gives off an eye-catching display when planted massively. It consists of tubular flowers rooted in globular ends, and it can grow up to a height of about 30cm -120cm. It also has an enticing scent that attracts hummingbirds and butterflies, which can help with pollination. Japanese Maple Tree – This plant is available in a variety of species that gives your garden landscape a whole new look. With vibrant leaf colors ranging from blood red and crimson to pink and golden yellow, the Japanese maple tree is one shrub you can’t fail to plant this September. Red Valerian – This well-branched plant is also known as Centranthus Ruber, and is often grown for its fragrance and ornamental features. It attracts butterflies and is somewhat pest-free. Red Valerian is easy to grow and blooms right from early summer to the fall season. 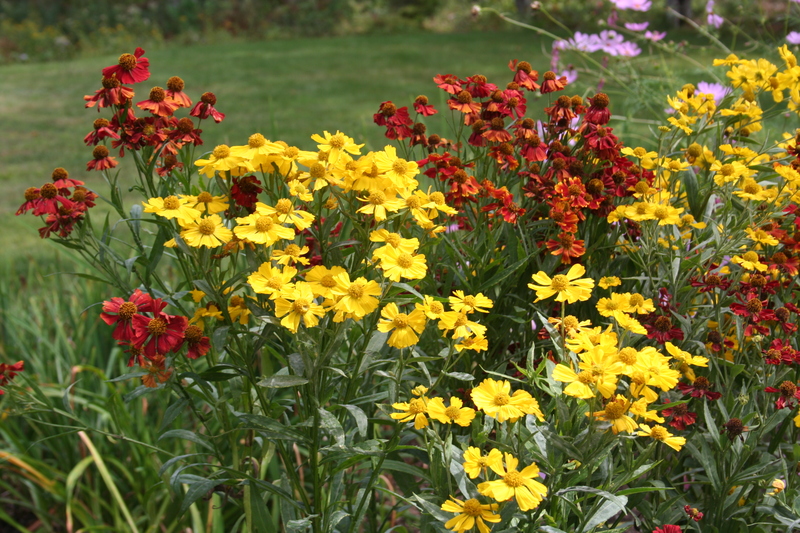 Helenium – Also called Sneezeweed; this plant is one of the best flowers to consider this September. When other perennials start to fade, Helenium springs up and splashes its brilliant yellow, mahogany, and brown colors to brighten your garden for many weeks. These elegant plants are some of the best choices of many gardeners in the Pacific Northwest, especially in Seattle and Washington, and you should consider planting them this September. If you would like these flowers and shrubs professionally planted or need more choices to grow this September in the Pacific Northwest, Contact Levys Lawn & Landscape Today!